Travel Pilgrimage tours in Himalayas, the most sacred and revered mountain ranges. The major pilgrimage sites in the Himalayan region are Kailash Mansarovar, the Char Dhams, Kedarnath, Badrinath, Yamunotri, Gangotri and lot more. The abode of the Goddess Vaishno Devi is in the Moutains of Trikuta Hills, in the Jammu and Kashmir State of Northern India. The Goddess resides in a beautiful cave in the form of 3 'Pindis' namely, "Maha Kali", "Maha Laxmi" and "Maha Sarawati". The Goddess Durga is said to have killed the demon Bhairon here. Vaishno Devi is 61-km north of Jammu and 14-km from Katra. The cave is at an elevation of 1,700m (5,100ft) and is 30m (93 ft) long and just 1.5m (5ft) high. Vaishno Devi is a hard four-hour (13-km) climb from Katra. The best time to come is March to July, as th rest of the time of the year it can be very cold. The main pilgrimage time is March-April and September-October. In 1986, 1.6 million people came here, or 15 to 20 thousand people a day. The cave ideally handles just 8 or 10 thousand people a day, as only 12 or 15 people are let into the cave at a time. On the full moon day in Kartika (October/ November) the line to get into the cave can be 4-km long. It is believed that the arm of Goddess Sati fell at this place. According to a legend the holy shrine of Mata Vaishno Devi was discovered by a Brahmin, Pandit Sridhar about a thousand years ago. He used to live in Hansali village at the foothills of the Trikuta Mountains. One day, as he was grazing cattle, he met a beautiful child, Vaishnavi, on the hills. She urged him to call the people of his village to a feast. By mid-day when his guests arrived he had still not made arrangements for any provisons. Suddenly, he saw Vaishnavi coming out of his hut and she asked Sridhar to call his guests saying the food was ready. He watched in amazement as all the villagers went inside his small hut and finished their meal. As they left , he called out to young Vaishnavi knowing that the answer to the mystery lay with her. But she was not to be found. His search for her led him to a a cave up a cliff where he thought he spied her. But in vain. As he wept in anguish a light shone on him, and he had a vision: Vaishnavi was transformed into a transcendental beauty with eight arms and astride a lion. She told him she was Shakti and in this cave she was manifested in her three forms of Kali, Lakshmi and Saraswati. Sridhar's progeny have been worshipping the Goddess in this Holy Cave since those hoary days! After ardh Kuwari the path gets very steep for 2.5-km. This ascent is called Hathi Matha ascent, because the mountain is shaped like the forehead of an Elephant. It is best to use the footpath rather than the stairs, as the climb will be easier. From here it is another 1,500-ft climb to Sanjhi Chatt, and from there another 4-km to the carve. 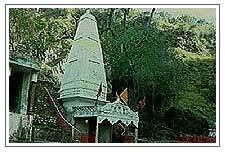 This temple is about 2.5-km from Vaishno Devi cave at about 6,700 feet. It is traditional to visit this temple after visiting the Vaishno Devi Temple. Bhairon (Bhairav) was absolved of all sins when Durga killed him. When Bhairon was killed by the Goddess his head flew to this place. There is a huge stone outside the cave that represents the body of Bhairon. After he was killed, her prayed to the Goddess to forgive him. It is said that the Goddess gave the benediction that the desires of her devotees who visit this place would be fulfilled. 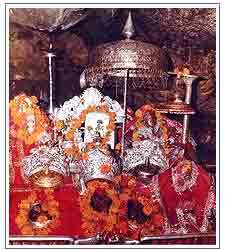 Vaishno Devi is located 14-km from the town of Katra and 52-km north of Jammu. Katra is situated at 2,800 feet and takes about 2 hours to reach from Jammu by bus. The nearest airport is in Jammu, which is 48-km from Katra. There is a helicopter service that departs from the airport at Sanjhi Chat in Jammu in the morning. The nearest railway station is in Jammu, which is well connected to all the major cities in India. There are regular buses leaving for the 52-km trip from the central bus stand in Jammu to where the road ends at Katra (2 hr). Walking From Katra it is a steep 13-km walk. You can rent a horse or be carried up from Katra. You can go up to the cave and back in the same day. It takes about 4 hours to climb up and 3 hours to come down. Pilgrims must get a Yatra- Slip from the tourist reception center near the bus stand in Katra to get pass Ban Ganga. It is Hard climb to Vaishno Devi. You must pass through Katra to get to Vaishno Devi. It is where the road ends. There is an ISKCON temple (01991-33047)in Katra. It is located at the Kalka Mata Mandir, opposite the petrol pump. The Kalka Mata Mandir is an ancient Siva and Kali temple which has been put under the care of ISKCON. The deities are said to be self-manifested. This temple is visited by many pilgrims. construction has begun on a temple and large guest house here.